Numeros. Zahlen. Numbers. No matter what the language, the meaning is the same. We are delighted that the number of supplies taken by Pack for a Purpose travelers to community projects across the globe continues to grow! More than 35 new accommodations and tour companies have joined Pack for a Purpose since January, and we continue to welcome new participants. 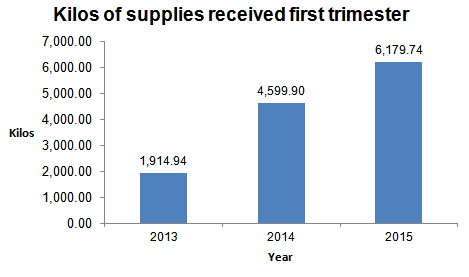 PfaP first started recording supplies received by trimester in 2013 (previously, the numbers were only recorded annually). Since 2013, Pack for a Purpose has seen a more than 200 percent increase in the number of supplies delivered to our participants—and the numbers for the first trimester of 2015 are still coming in. Since 2014, there has been a 34 percent increase in the number of supplies taken by Pack for a Purpose travelers benefitting community projects across the globe. Since the beginning of 2015, three more countries have been added to our website. You can now make a Big Impact in even more places around the world when you choose to Pack for a Purpose. PfaP volunteers continue to donate their expertise and hours and hours of their time to keep our organization effective. From January through May, they provided more than 1,925 hours of their time and energy. We hope you choose to be a PfaP traveler in 2015. In addition to taking requested supplies to the places you travel to, you can assist us by spreading the word about Pack for a Purpose on your social media and in personal conversations so that by 2016, Pack for a Purpose is the go-to website for responsible travelers.